I marry many couples right outside of the local courthouse in quick civil ceremonies. This is a very convenient, no-frills, affordable way to get married super-quick. Yet sometimes couples want their wedding day to be a little more special and memorable. Stephen and Connie were one of those couples who really made their elopement memorable. They came to Winchester and stayed in town at the highly-recommended George Washington Hotel. To make it even MORE special of a stay, they both had separate rooms so that they would not see each other on their wedding day! On the day of their elopement I met Stephen at Blandy Farm (one of my personal favorite elopement locations) in the late afternoon. I definitely knew it was him thanks to his super slick purple suit. We picked out a spot for them to exchange their vows, and then after positioning Stephen so he could not see Connie, I met her in the parking lot and led her to where Stephen was waiting. Once in position, I had him turn around, and he got to see his new bride for the first time (that day haha) as she walked down the gravel road aisle surrounded by nature and the peace of the outdoors. During the ceremony they both exchanged really awesome personal wedding vows (never required, but always cool to hear when a couple does). Their wedding rings they also had hand-made by a ring craftsman. After they were married, we spent the rest of the time taking photographs all over the Blandy Farm / Arboretum area. They had a blast having their photos taken, as can be seen from the examples below. 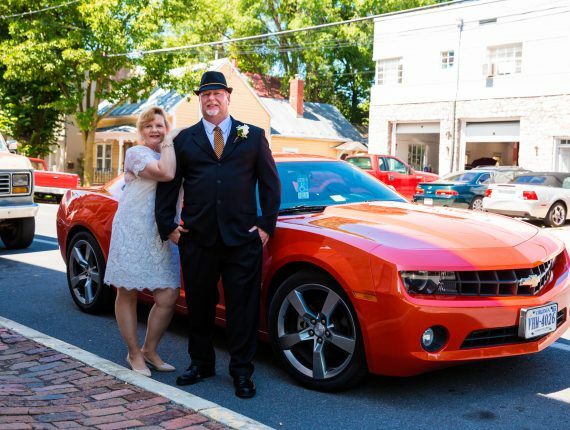 Do you want to create your own memorable elopement experience in Virginia like Stephen and Connie? Not sure where to start? Send me a message and I would be happy to help you get started! “Thank you so much, Aaron. The pics are beautiful!” – Connie B.